via Mark Lisanti in his weekly Lost column, invoking my favorite public works project that couldn't quite get off the ground despite the appeal of good music and good coffee - the Super Train from Singles the movie! 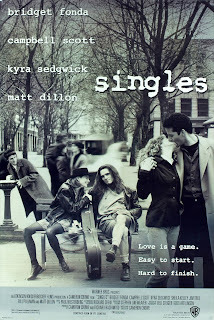 The actress who played Zoe (Sheila Kelley) was also the unlucky-in-love Debbie from Singles. (Kids, ask your Generation X parents!) We know there are no accidents in this series, so what’s the Lost connection? Back in 1992, mysterious industrialist Charles Widmore was closely monitoring Campbell Scott’s work on the SuperTrain, which he’d hoped could one day provide a pleasant commuting experience between the West Coast and the island. But even with the promise of great coffee and great music on the SuperTrain, the construction of an underwater tunnel to the island was cost-prohibitive, and Widmore had to abandon this pipe dream. Additionally, Peter Horton was the original choice for Desmond, but his Scottish accent was justterrible, like a drunk Irishman doing an impression of the Queen.